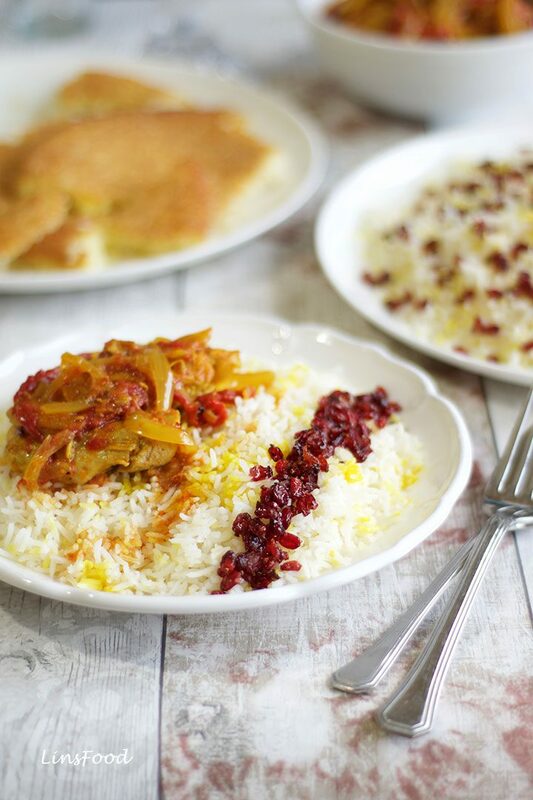 Zereshk Polo Morgh is a simple, yet classic Persian (Iranian) rice flavoured with barberries and served with a chicken stew (khoresh). 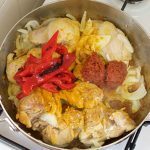 The dish is made up of 2 parts: the aromatic and slightly tart rice and the light chicken stew with hints of sweet and sour. Zereshk Polo Morgh is perfect for entertaining or for just a regular meal. You could cook just the Zereshk Polo (Barberry Rice) without the chicken stew, and serve it with other Persian stews or even Indian curries. Let’s take a look at the name as usual. 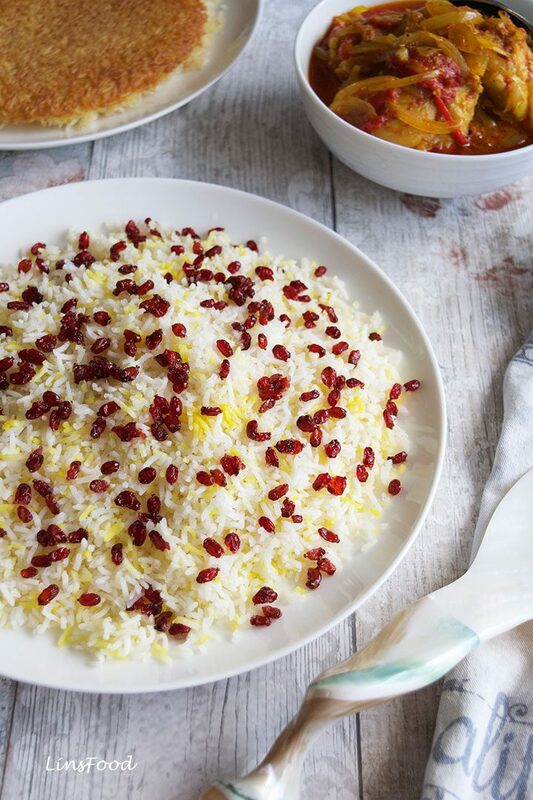 Zereshk polo, in its most basic form, is Persian steamed rice, flavoured with saffron, then layered (or topped) with barberries. 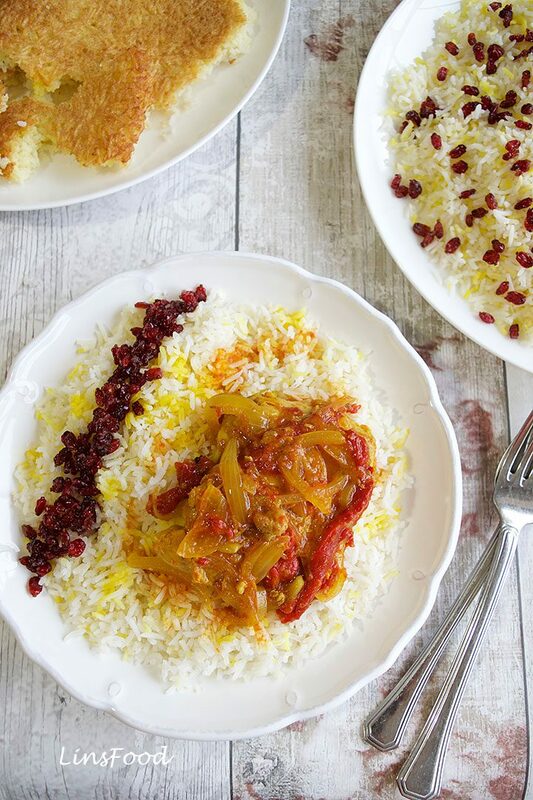 The zereshk provide a tartness to the rice, perfectly complimenting the floral, musky and a touch bitter saffron. The more elaborate zereshk polo can be garnished or topped with nuts, caramelised onions and rose petals. I like to keep mine simple when I’m making it for a family meal, keeping the extras for parties. The second part of the recipe is the light, tomato and saffron flavoured chicken stew (khoresh). Chicken thighs are your best bet here, given their stronger flavour. On the bone will produce a slightly deeper sauce, but leave it boneless, if you prefer. Skin or no skin – I’ll leave that completely up to you. The chicken stew, as mentioned, has a tomato and saffron base. The tomato is in the form of tomato paste, but as always, when the recipe allows (the flavour doesn’t always work), I swap sundried tomato paste for the straight up version. It gives a more complex character to anything you cook it with. 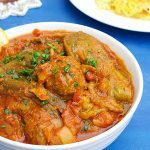 Capsicum (bell pepper) in our chicken stew – red goes nicely with the colour of the stew and add a touch of sweetness to it too. Sometimes, love to add some pre roasted or charred peppers strips to it for added flavour. 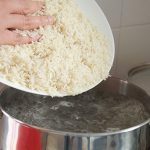 Cook the rice, according to the Persian Steamed Rice method. Click here to read more and learn the basics. Sauté the barberries in a little butter with some sugar. Serve the polo (rice) and morgh (chicken) separately, allowing each person to help himself to the dishes. Top the polo with the morgh, keeping the sauce separate. So each diner will dish up some rice and a piece of chicken, then, help himself to the sauce, as needed. 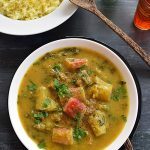 ⇒ Bear in mind, you will have other dishes alongside the Zereshk Polo Morgh if you are serving it at a party (see gallery below). 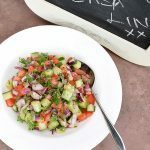 ⇒ When I make this for dinner, all I have on the side is a salad like Salad Shirazi, or if I’m feeling greedy, a simple omelette, or the simplified Persian Herbed Omelette on this site (see gallery below). Click here to read more. 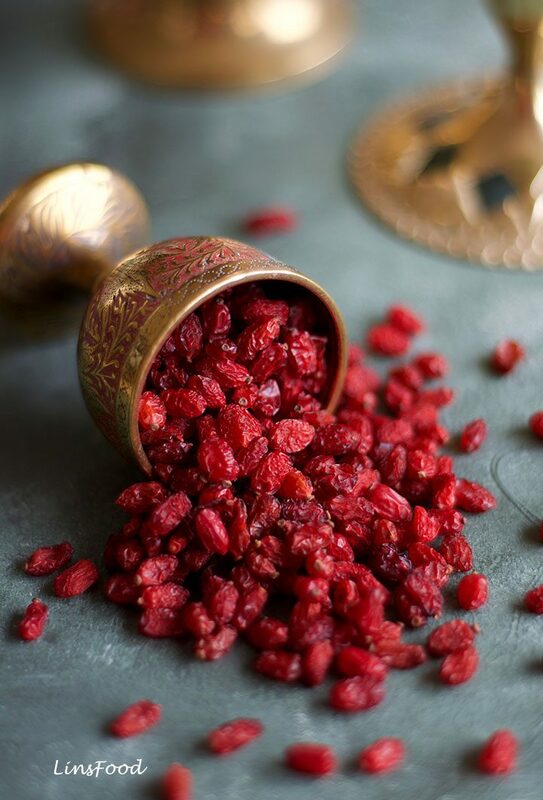 The tartness of the barberries is the underlying flavour in Zereshk Polo. We temper that sour quality somewhat by sautéing them in a little butter with added sugar. Barberries are an essential Persian ingredient and here in the UK, besides online suppliers, you’ll also find them in Waitrose. 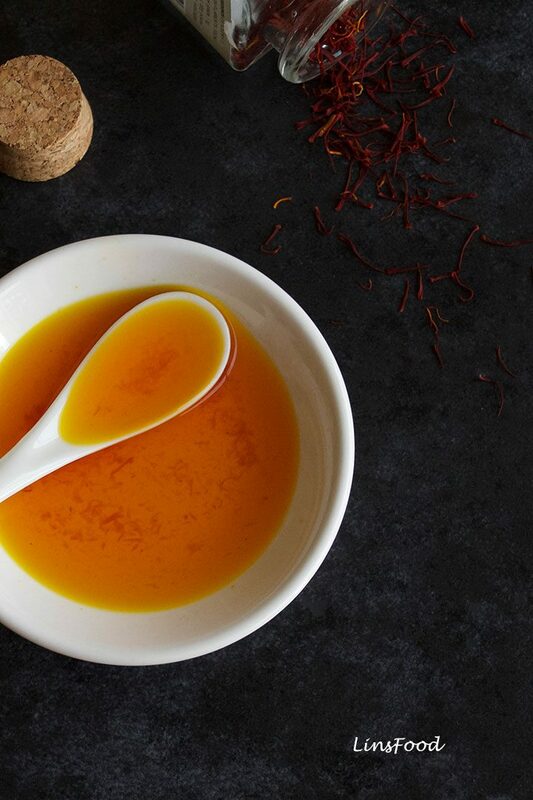 You will know by now that we convert the saffron strands into liquid saffron before using them in Persian cooking. As a matter of fact, I do that with all my recipes, of whatever origin. Click here to read more, and also for the video tutorial. It’s a simple case of crushing the saffron to powder and adding some hot water. I’ve given 6 Tbsp of water here, we use 5 Tbsp of liquid saffron in the recipe. Having extra is always a good idea. Feel free to use it all up to drizzle over the rice at the end. 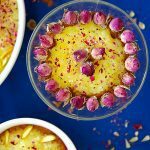 If you’ve been following my Persian recipes, you’ll remember the very first Persian recipe we did for our Persian Recipes Masterclass: the Persian Steamed Rice with Tahdig. In that recipe, I finish the rice off with some optional rose water, which heightens the aroma of the rice. I’ve omitted it here, as I think the rose doesn’t quite go with the tomato and chicken stew. All in all, the cooking of the rice itself will take an hour, during which time, we’ll be making the chicken for the recipe. 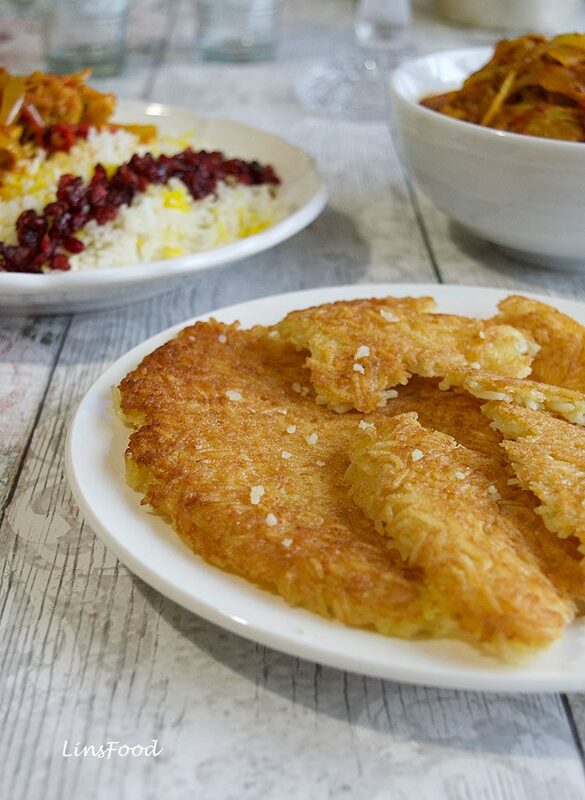 Tahdig is the crispy bottom layer when cooking Persian rice. It is, to many, the prized part of Persian rice dishes. I’ve kept it simple here, making the tahdig with just rice and yoghurt. You can add an egg if you like, click here to read more about it. If you really, really, must cut down on the cooking time, check out the Easy Persian Saffron Rice Recipe that I developed for some lazy busy students and readers. It’s perfect for our Zereshk Polo, as we’ll be adding the zereshk later, after the rice has been cooked, unlike the Morasa Polo (Persian Jewelled Rice), where the barberries go in with the rice. I think we’ve covered everything. There is only one thing left to be done – the cooking! 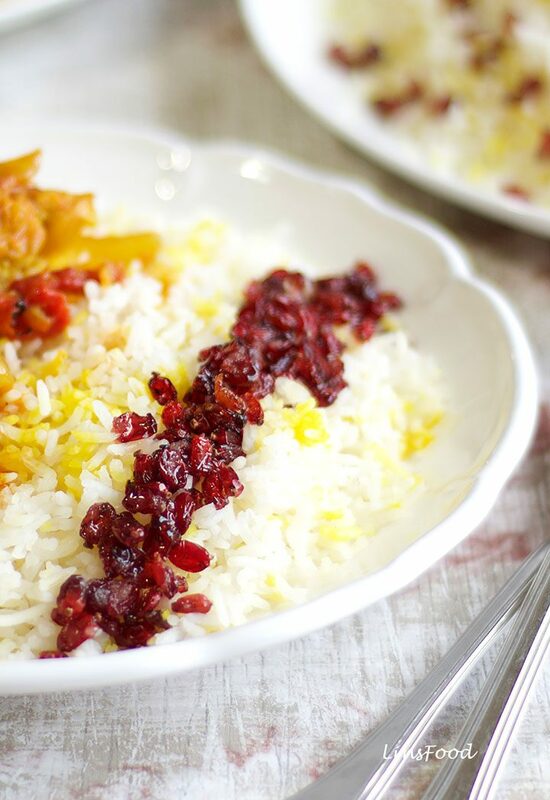 Zereshk Polo Morgh is a simple, yet classic Persian (Iranian) rice flavoured with barberries (zereshk) and served with a chicken (morgh) stew (khoresh). Crush the saffron and salt, using a pestle and mortar, to a powder. The salt aids the crushing. A round and round motion is better here than pounding, because the saffron pistils are fairly tiny and flat. Add the hot water, and leave to stand while you get all the other ingredients ready. Bring a large, roomy saucepan full of water to boil on high heat. Add the salt to it. When the water is boiling, tip the rice in and bring back to boil on medium heat. Cook for 7 minutes, then drain the rice and give it a rinse in cool/cold tap water (depending on the season). Drain and set aside. Steaming the Rice, starting with tahdig. Wash out and dry the saucepan you used to parboil the rice, then place it on medium heat. For the tahdig, see proportions above. Mix the 2 ladles of rice rice, yoghurt and salt. Heat the saffron and butter in your saucepan, and swirl it around for a few seconds. Tip the rice mix in and flatten with the back of your ladle. Leave to cook for a minute. Gradually add the rest of the rice on top of the tahdig, ladle by ladle, forming a conical shape. The reason for this is that traditional chelow pots were conical, giving you a wide base for your tahdig. Also given the long cooking time, whatever rice that touches the side of the saucepan is going to crisp up slightly. So you want as much of the rice away from the edges as possible. Sprinkle 2 Tbsp of the liquid saffron all over. 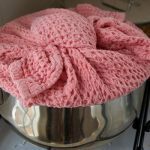 Wrap the saucepan lid up with the towel and place on the saucepan, ensuring it's a tight fit. The towel is there to absorb any excess moisture, preventing soggy rice. Make sure your tea towel is nowhere near the flame! Cook on that same medium heat for 5 minutes. This should be enough time for the steam to build up. My mum used to wet her fingers and touch the side of the saucepan and if it "sizzled" that meant there was enough steam. At this stage, lower the heat right down and let the rice steam away for 45 minutes. This will produce a golden tahdig, the way I like it. If you prefer a darker shade of brown, go for 60minutes. 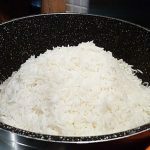 When the rice is done, take it off the heat, top with pinches of the 2 Tbsp of butter, cover, and leave to rest for 10 minutes before you start dishing up. While the rice is steaming, let's get the chicken going. Heat the oil in a saucepan on medium-high heat, I like using a wide and shallow dish. Lightly brown the chicken on both sides, about 2 minutes each side. Add the onions, lower the heat to medium, stir and fry for a minute. Now add the saffron, turmeric, tomato paste, and bell pepper. Give it all a good stir to coat and mix, as much as you can manage. Add the water, salt and some pepper, stir to mix, and bring it to a boil. Then lower the heat right down, cover and simmer for 20 - 30 minutes. 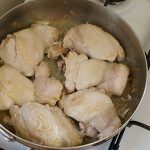 If you are using boneless chicken thighs, they will be done in 20 minutes. On the bone will need longer, 30 minutes should do, 45 if the chicken thighs are very big. You will know the chicken is done, when the part that's attached to the bone is coming apart and no longer red. Check the seasoning, add more salt if you need it, or a little more water if it's got a little dry. Don't forget that sauce is going to feed at least 4 people. Turn the heat off, finish off with a good sprinkling of freshly ground black pepper and stir the vinegar in. Heat the butter in a small frying pan on low heat. Swirl it to coat the pan and to encourage it to melt. Toss the barberries in, along with the sugar and fry for a minute. The sugar will dissolve and counter the tartness, the butter will take on the flavour of the barberries and the sugar. Don't let the butter burn. A minute is all you need here, the barberries will be glistening. Set aside. We dish the rice up onto a large platter by layering it with the barberries. So spread half the rice onto your platter. Scatter half the barberries all over. Top with the second half of the rice and follow with the rest of the barberries. Sprinkle the rest of the liquid saffron all over. 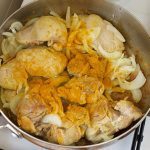 You can either serve the chicken stew in a separate bowl or top the rice with the chicken only and serve up the sauce in a separate bowl, as mentioned in the description at the start. What a gorgeous dish of rice! Perfectly glamourous for any festive table. I’ve bookmarked it for the coming Eid but I’ll try it a couple of times before so that it comes out looking as pretty as yours is to impress my guests. Lots of ingredients, but for some reason, I feel like the rice is the main character. The crunchiness of bottom rice meets the tartness of berries and the sour from tomato! Thank you, Kenta, the rice is the main player here. Lots of ingredients because this is essentially 2 recipes. I am beginning to plan our Norooz menu, dearest Azlin. My DH doesn’t eat fish and I don’t fancy the jewelled rice this year. So zereshk polo, maybe reshteh polo. The lamb looks good is it difficult to make. And have you got reshteh polo here, I can’t find it. Hi Azita, I love planning menus, and have a few done for clients already. The lamb is pretty easy, jut a case of marinating it and placing it in the oven. It makes a great table centrepiece. Reshteh polo recipe is being drafted as we speak. I’ll post it tomorrow and will send you an email when it’s done. Hi Azlin, I would like to make this for dinner tomorrow. Do you have a recipe with different tahdeeg? I remember the potato one being my favourite as a child in Iran. Thank you. Hi Javaneh, not currently, although the next post on rice for Nowruz will have a potato tahdig. 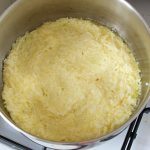 All you need to do, is thinly slice a medium potato, and line the bottom of the pan in a single or double layer, after the oil. Make sure your potatoes are cut pretty thinly, so they’ll cook. Leave them to cook for a minute, then pile the rice on and follow the recipe. Look out for Reshteh Polo this week. Hi Azlin, I’d like to make this for Valentine’s dinner, with the rice pudding. 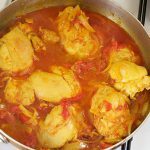 Can I make the chicken stew the day before? Hi Susie, yes, definitely. The flavour will only improve overnight. Heat it gently, taste it, and add another half tsp of vinegar before serving. Thanks Azlin, just made this for dinner tonight. Everything went smoothly. Your instructions are great. Hi Susan, so good to hear that! Were the inlaws impressed? Haha, yes indeed! MIL was really, really impressed with the whole meal.Father in law loved the sholeh zard best, said it was just like his mum used to make! So that’s praise indeed! Thank you! Awesome, and it’s a pleasure. This is simply spectacular. I love your basic steamed recipe, but this chicken stew takes it to a different level. Thanks Azlin. I am looking forward to trying this for family lunch tomorrow. Thank you, Harriet, let me know how it goes. This is an amazing recipe! Thank you. So much detail in the prep and cooking. Thanks Sue, fairly easy to make too. Just got this in my mailbox, and what a great way to start the weekend! I am sharing this everywhere! I have so many friends who ask about Persian rice and I always point them to you. This recipe you promised me about 2 years ago! Remember? Thank you so much, I can always count on you. Have a lovely weekend, dearest Azlin. Haha, it took me only 2 years?! Thank you Farzana, happy to oblige, you have a lovely weekend!